Stampin’ Up! 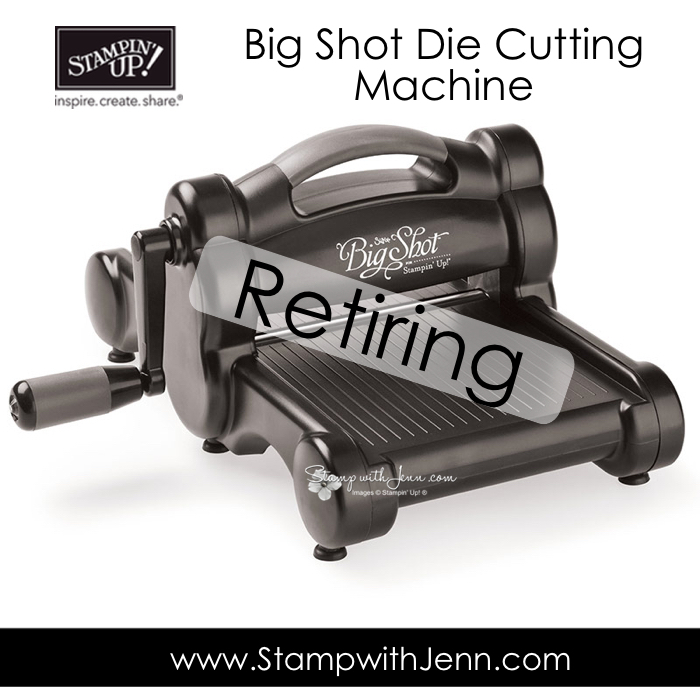 is making changes to two of our tools: The Stampin’ Trimmer and the Big Shot. See more details on both items. The urgent part that you need to know is that supporting items, as well as these tools, will be discontinued on the retiring list as of April 15th. Likely these items will be sell out quickly. My advice is to get these items ASAP so you don’t miss out. Here’s the items that will be affected. This list is in order of what I think you should order ASAP! Please see the end of this post for more details on the changes. 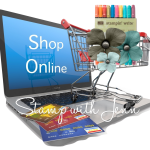 To place an order, you can either contact me directly at fun@stampwithjenn.com or Shop Online Here. I especially recommend stocking up on Trimmer Cutting Blades and Big Shot Standard Cutting Pads as these items are likely to go the fastest. The Stampin’ Up! 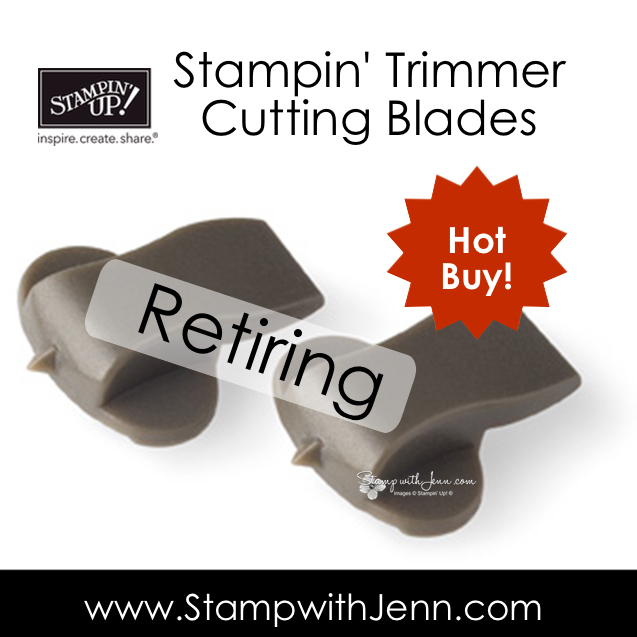 Stampin’ Trimmer will retire as of June 3, 2019, including all accessories—replacement cutting blades, scoring blades, and cutting mats. Stampin’ Up! has experienced challenges with their supplier and they are taking the opportunity to research and explore a replacement option for this product, which will not be the same as the current Stampin’ Trimmer. 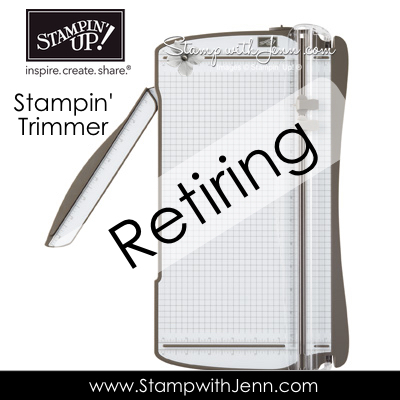 There will be a gap in time between when the current Stampin’ Trimmer retires and when a new product becomes available, but we do not currently have an estimated timeframe. Once they feel confident in the new offering, they will communicate more details with us about the new product. Currently, there is an order limit of 3 Trimmer Blades per order, but that will increase to 6 on Monday, April 15th. Supplies are only available while they last. So if you own this trimmer consider ordering replacement parts ASAP. Stampin’ Up! is making some big changes to the die-cutting and embossing product line that will give them a better opportunity to support the long-term vision they have for the line. While they have worked with their current supplier for many years, they have had the opportunity to reassess this relationship. After extensive research, demonstrator feedback, and evaluation, they have decided to move in a new direction. However, release of a new die cutting machine is delayed while they sort out some issues. Because of these setbacks, there will not be a die-cutting & embossing machine in the 2019–2020 annual catalogue. The new catalogue, however, WILL continue to offer new dies and folders and continue to carry some of the older style ones. Since Stampin’ Up! is using a new supplier, the dies and folders will be manufactured differently; this means the way you use the new style of dies and folders will be a little different than how you used the old style. Both the new-style and old-style dies and embossing folders can work with any die-cutting & embossing machine (in some cases, adaptations like shims may be required because the gap between rollers on machines may vary slightly between manufacturers). So if you have had this machine on your list for a while, now could be the time to get it as we do not know how long we will wait for the “new” and “improved” version. 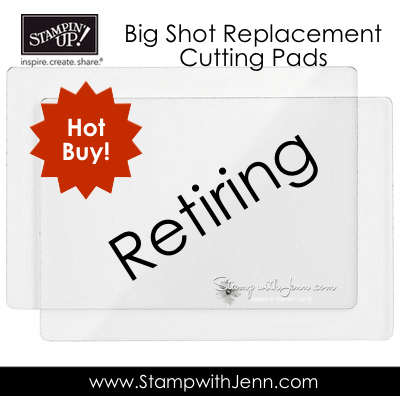 And if you currently have the Big Shot machine, please make sure you are stocked up on Cutting Pads. Please make sure you are subscribed to my newsletter for more updates on these products and others. Subscribe HERE. l Get them Before they are GONE!